Part No: UPS20003 Category: Uninterrupted Power Supplies (UPS). Tags: 2700 watt, 3 kva, extended run, lab, online, power inspired, uninterrupted power supply, ups, vfi range, VFI3000BL, voltage and frequency independent. 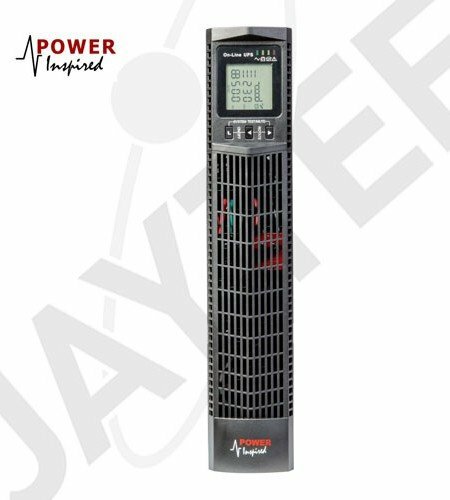 This model is a fully featured online double conversion UPS System with 3KVA and 2700W rating that can be rack mounted in a 19″ rack, or vertical standing with supplied support brackets. This unit does not contain internal batteries. It is designed for connection to a large battery bank for long runtime application. Recharge time is significantly reduced thanks to the internal 12A charger. A comprehensive LCD display gives full UPS status and can be electronically rotated for viewing in either horizontal or vertical orientations. ECO mode can be enabled to improve operational efficiency safe in the knowledge that should the mains go out of limits the inverter will immediately take over. The front access internal battery pack allows for easy replacement of batteries, and this can be done live without having to power down the load for maximum uptime.